Description: Lite power move through Dolton, Illinois - March 23, 1978. 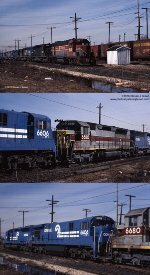 Locos: Bangor and Aroostook (built 1967, became WAMX GP38-3 3821), CR SD40 6308 (built 1966 as PRR 6065, became HLCX SD40M-3 6066), CR SD45 6133 (built 1966 as PRR 6133), CR GP40 32? ?, CR SD45-2 6688 (built 1970 as EL SDP45 3657, to MRL 332 became YCR 332), CR SDP45 6680 (built 1969 as EL 3649, became NW 6680), CR C30-7 6606 (built 1977, to HLCX 594 then sold to MRS in Brazil), CR SD745 6165 (built 1967 as PRR 6165). Description: IHCR gets a crew change at Hornell. Gotta love that 3 builder lashup! 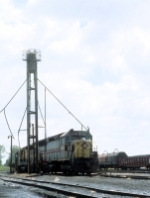 Description: CR SDP45 6680 and SD40 6277 help ease boxcars down Horseshoe in March, 1981. Description: While a crewman gets the scenic view aboard 6277, CR SDP45 6680 assists the SD40 in easing boxcars down Horseshoe Curve in March, 1981.